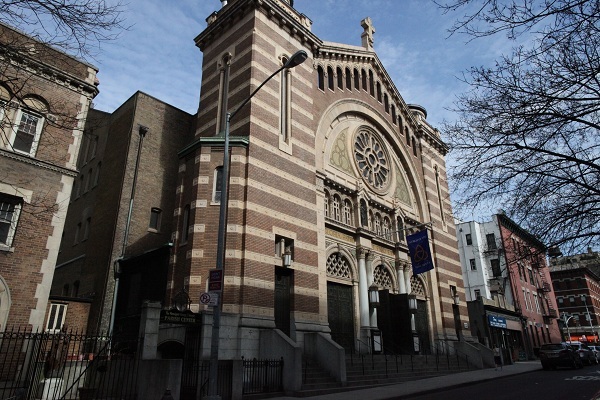 The Upper West Side was particularly creative in the great age of Catholic Church building 1890-1920. Here, in what seemed to be the future center of wealth and culture of the city, the plans were bolder and the resources more lavish than elsewhere. 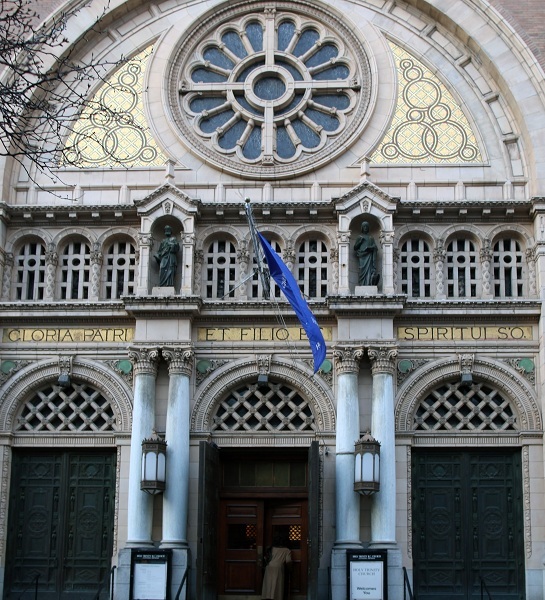 St. John the Divine on West 112th Street had helped set the pace. 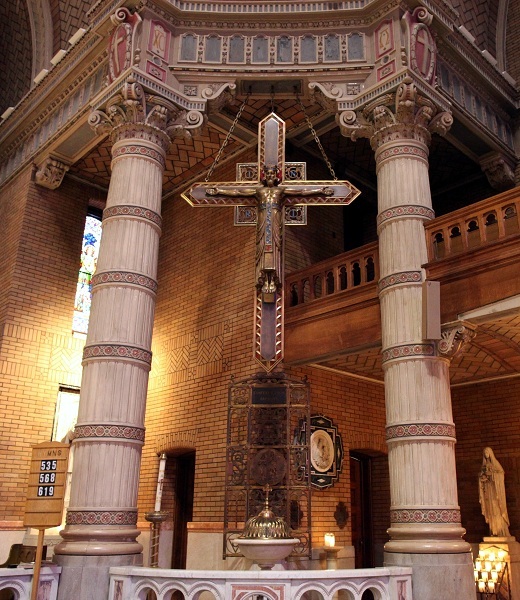 For the Catholics, there arose a French baroque dome inspired by Mansard (Notre Dame) and a cathedral in the style of 13th century Gothic (Blessed Sacrament). 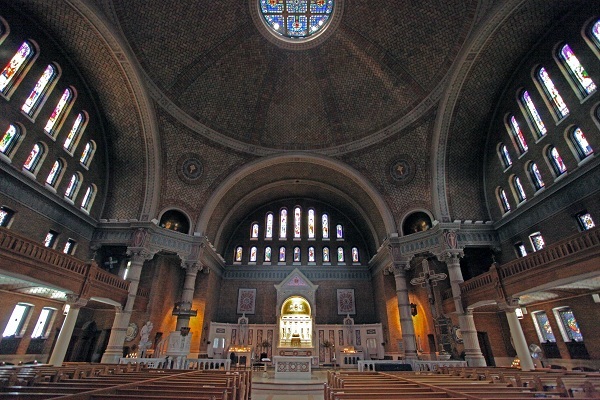 And then we have what is surely the most outrageous and audacious parish church in Manhattan: New York’s own Hagia Sophia: Holy Trinity. 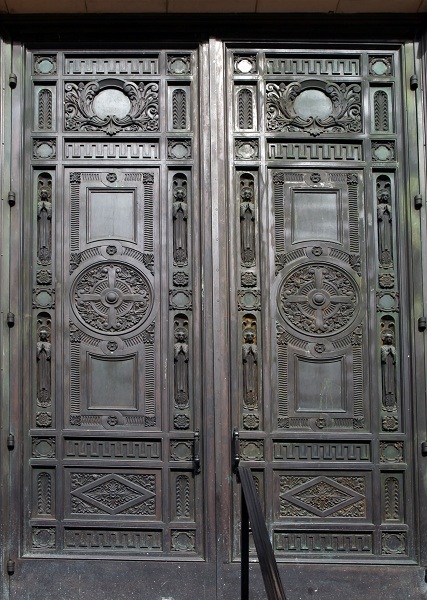 The façade does not prepare the visitor at all for the overwhelming impact of the interior. 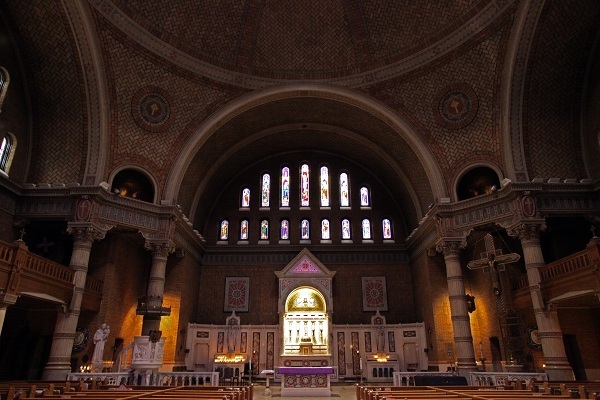 Holy Trinity is a vast centralized space with balconies on three sides and crowned by a vast, soaring dome. 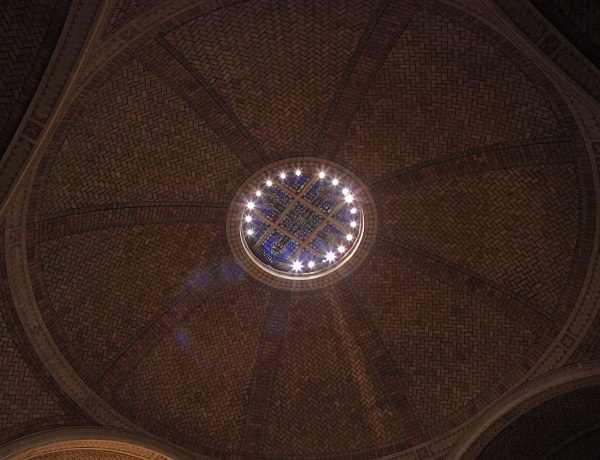 This dome is covered by the famous Guastavino tiles of pre-World War I era. 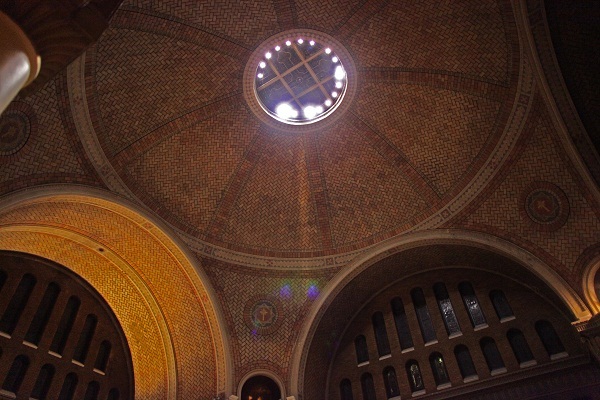 At its apex there is a Pantheon-like oculus – here covered by a skylight. 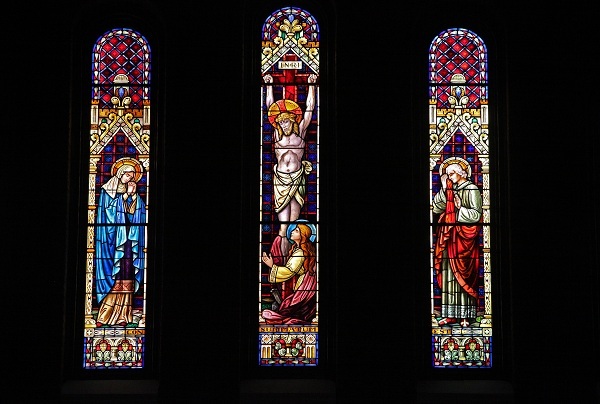 Thanks to the numerous but relatively small stained glass windows all is shrouded in mysterious, prayerful darkness. 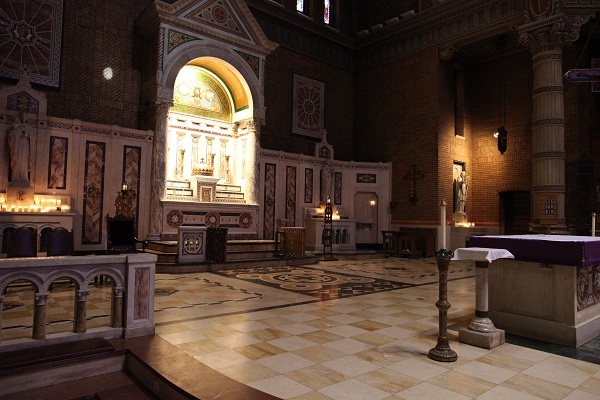 The sanctuary, set against the North side, is partially encased in beautiful marble. 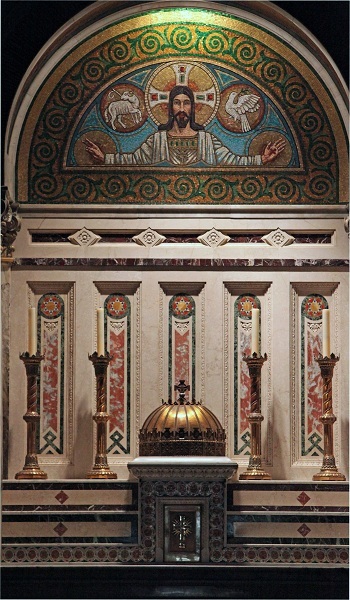 The high altar is distinguished by a baldachin and mosaic. 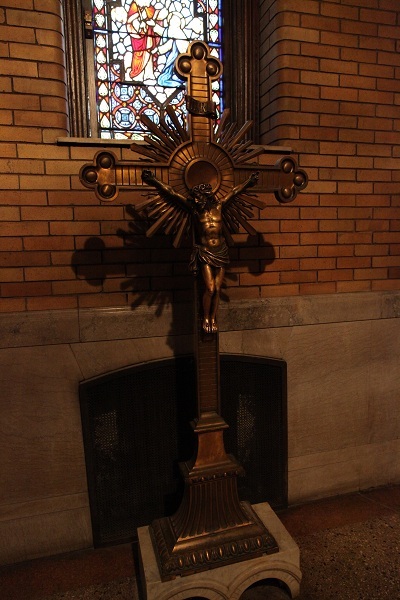 To the east of the high altar is suspended a magnificent metal crucifix in the style of the 12th century. 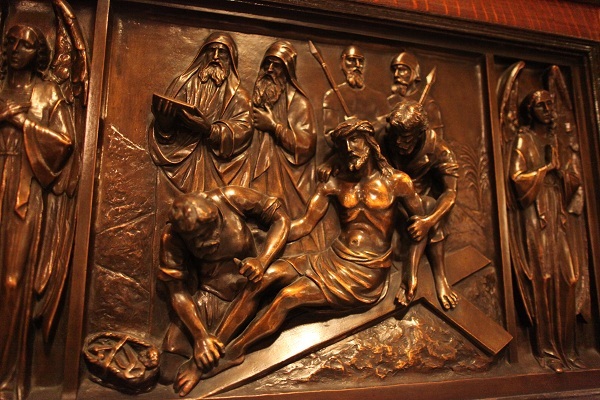 Throughout this church, indeed, the lavish statuary, stained glass and particularly metalwork are of the highest quality. 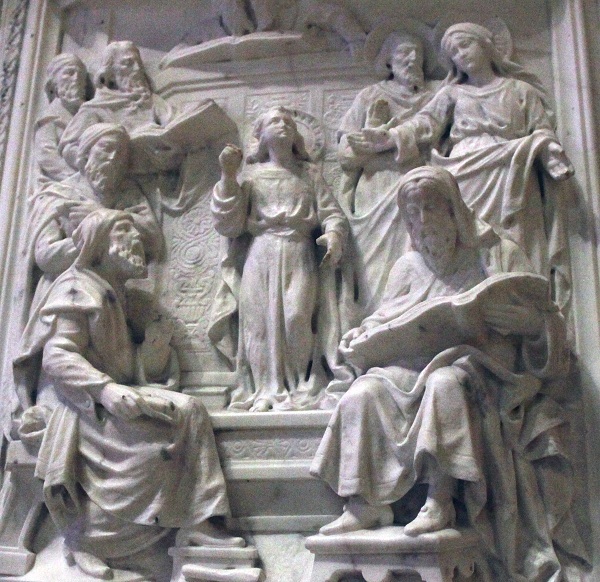 Christ in the Temple – the Pulpit. Holy Trinity in the Evening. 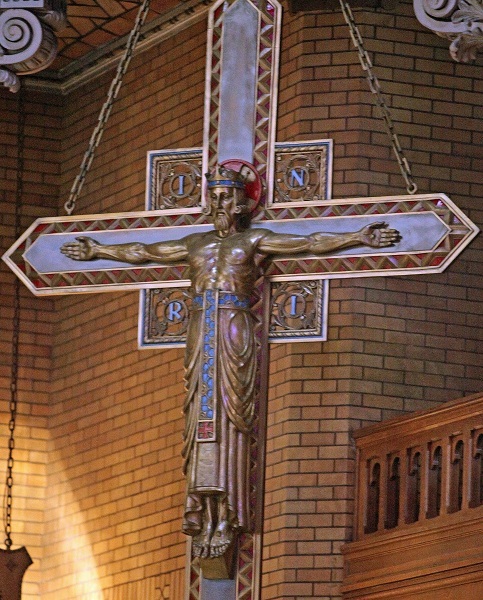 The crucifix from the high altar now in a rear corner. 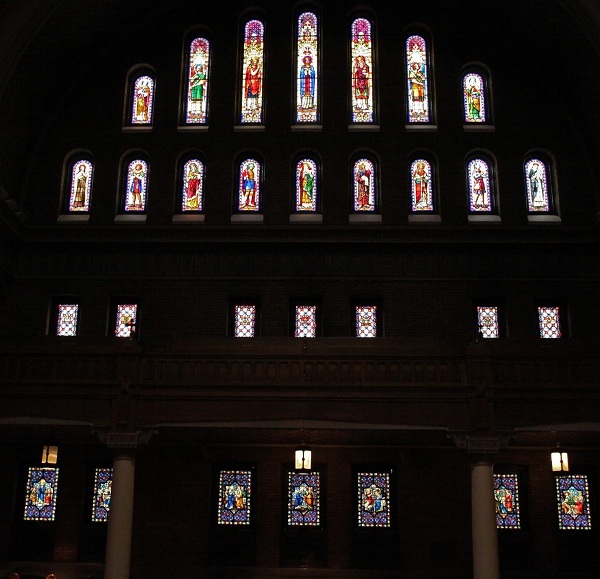 Holy Trinity is a vast, impressive achievement in brick, terra cotta and stone. 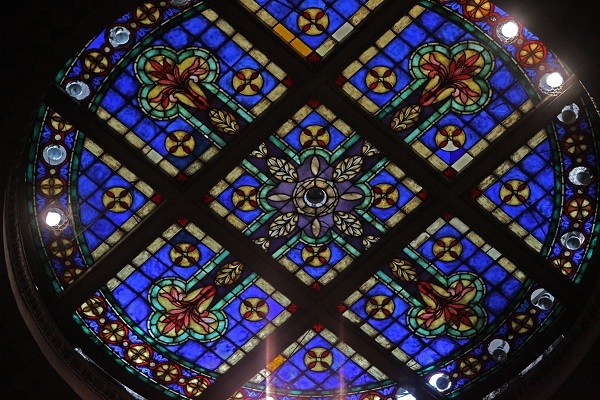 However, I find that aesthetically this church does not reach the heights of some of its sisters of that era. For all its exoticism, Holy Trinity bears a very strong reflection of certain trends of contemporary Beaux Arts secular architecture. Both in its interior and exterior, for example, one can note disturbing similarities to the elephant house of the Bronx Zoo. 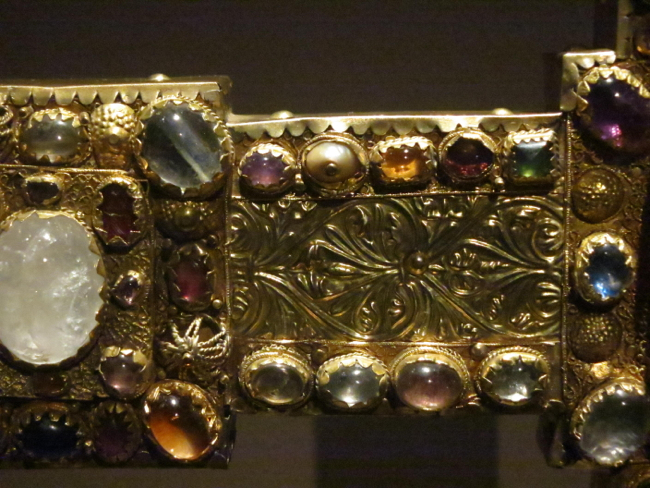 Budgetary restrictions also meant that the full glory of Byzantium could not be achieved – there are very few mosaics. 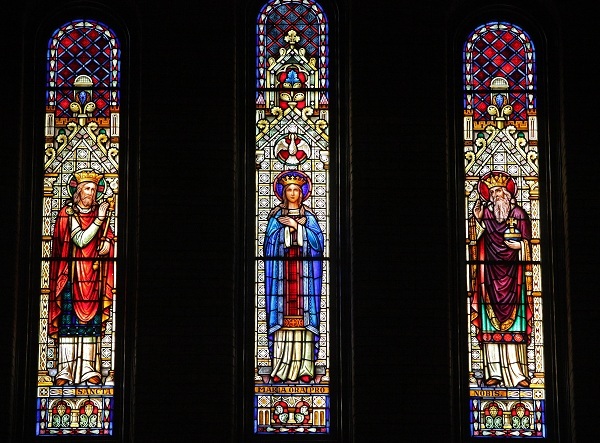 Despite all the vicissitudes of the last century, few churches are as redolent of the era of their creation as Holy Trinity. And yet its silent, tenebrous, otherworldly ambience is also the greatest possible challenge to the materialistic bustle of this city – then and now. 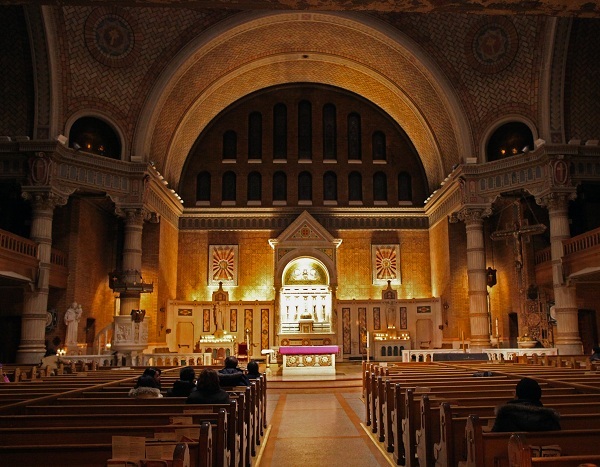 Is it for these reasons that a feeling of melancholy befalls the visitor leaving this church on a dark winter evening? 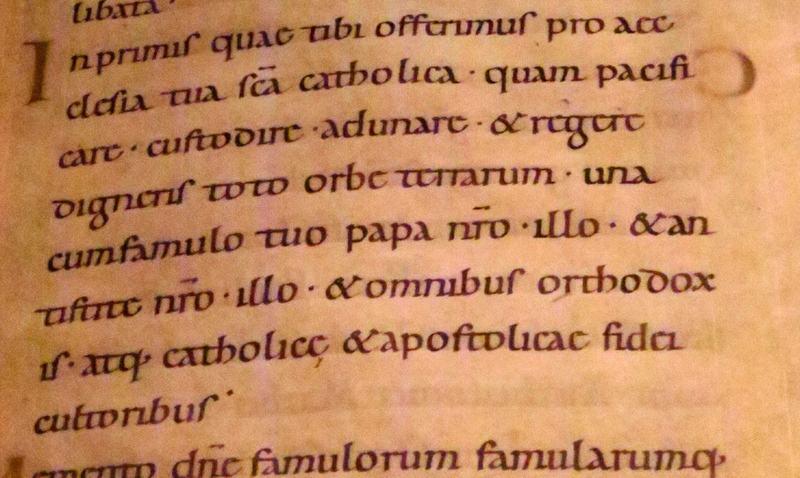 For here the capital of the New World Order encounters both a recreation of the glorious first ages of the art of Christendom and a memento of New York City’s own, seemingly equally distant Catholic past. How will this stark confrontation end? Up till now the struggle seems to have gone only in one direction – but fortunately the last word has definitely not been spoken…. 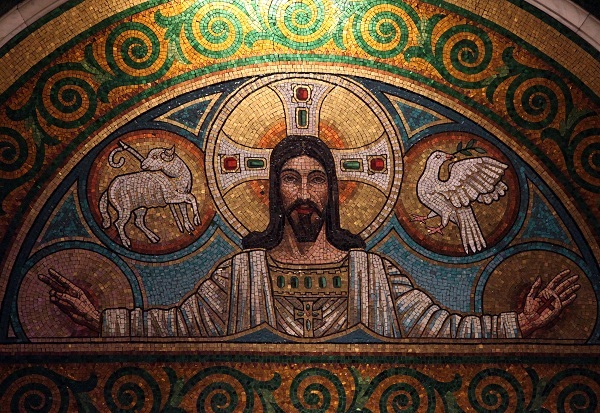 UPDATE: The Museum of the City of New York has available a magnificent set of 1931 pictures of Holy Trinity – after the completion of the interior decoration. You can check many of the images in this posting against these historical photographs. 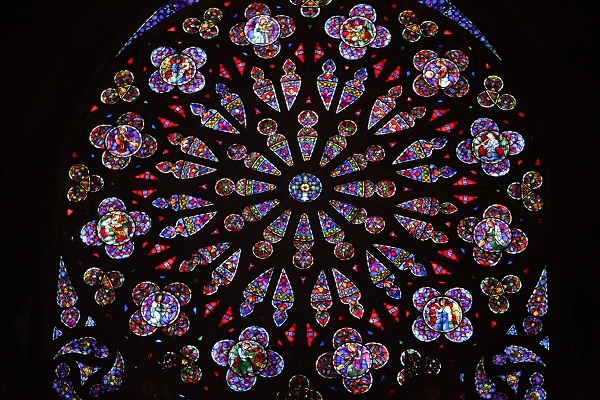 The most obvious, tragic loss: a huge central chandelier that appears to have been in the style of that of Aachen Cathedral. (Thanks to Samuel J. Howard for the reference). 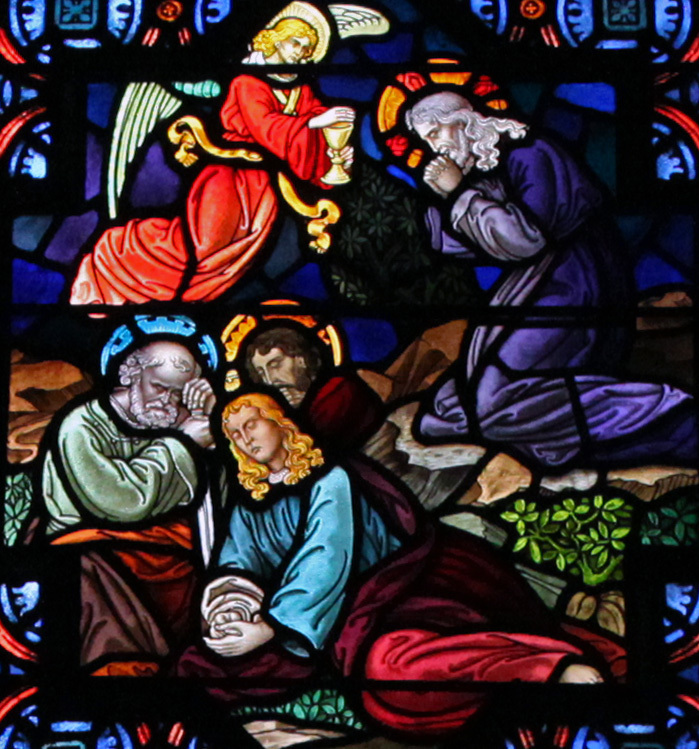 It is easy to overlook the splendid windows of this church. 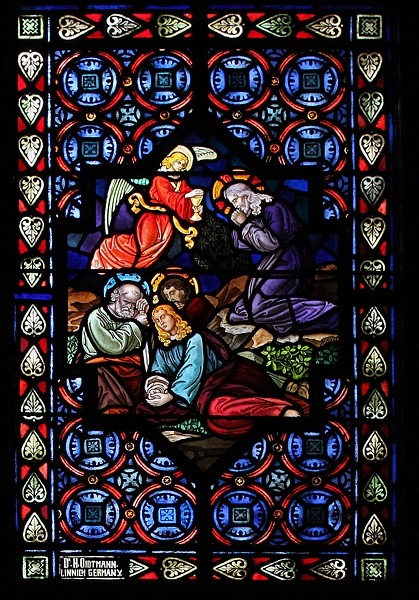 The lower windows are especially fine; they were made by the noted German firm of Dr. H. Oidtmann. From Linnich, they represent a departure from the usual Innsbruck or Munich windows of that period.